ScheduleOnce is a Google Calendar Add-on that helps you find a common time for your meetings. Schedule meetings earlier, faster, and avoid unnecessary email and phone tag. Engage your ecosystem with a professional scheduling solution. Active Organizer is an easy-to-use client for Google Calendar and Contacts which lets you work with your Google Apps directly from your Desktop. Multiple calendars support, quick search, advanced reminders, offline functionality for your Google Apps. Desktop iCalendar is a customizable desktop calendar which can sync with Google Calendar. The program adds calendar, events, to-do list and weather on your desktop. It allows you to edit your calendar offline and sync with Google Calendar when network is available. So you can edit your Google calendar offline, and share your calendar with your family, friends and colleague easily. Delete Duplicate Info in Google Contacts and Google Calendar. GG Duplicates Cleaner lets you remove duplicate information in Google Contacts and Google Calendar quickly and smartly. A calendar program that runs locally on your Windows desktop and syncs with Google Calendar, Microsoft Exchange, and online calendars. Reminders can be shared over a local network and sent via email, SMS, or voice phone - to yourself and others. Organize and synchronize Contacts, Calendar, Tasks and Notes information from multiple applications, including Microsoft Outlook, IBM Lotus Notes, Google Contacts, Google Calendar, ACT! by Sage, Palm Desktop, etc. WinCalendar is a Calendar Maker & Free Desktop Calendar that also integrates with both Microsoft Word & Excel. It supports importing of Google Calendar & Outlook Calendar Data. Can be used as a Google / Outlook Calendar converter (to Excel / Word). 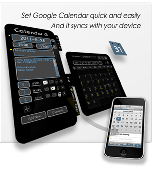 Calgoo Calendar synchronizes with Google Calendar, Outlook Calendar and iCal format. GCALDaemon is an OS-independent Java program that offers two-way synchronization between Google Calendar and various iCalendar compatible calendar applications. With DMS To GCal your Dental Management Software calendar is uploaded to a Google Calendar. With DMS To GCal your Dental Management Software Calendar is uploaded to a Google Calendar. DMS To GCal is completely automated and keeps your Google Calendar up-to-date. Now you can view your schedule from anywhere. Atchoo is a simple yet elegant application, providing desktop notifications for Google Calendar events. Atchoo is a simple yet elegant application, providing desktop notifications for Google Calendar events. Atchoo connects to one of your Google calendars and reminds you of its upcoming events, allows you to either snooze or dismiss an event and can create events using Quick Add. GG-CSV Converter is an easy-to-use application that lets you convert information from Google Gmail contacts and Google Calendar into CSV (comma-separated value) files. GG-CSV Converter is an easy-to-use application that lets you convert information from Google Gmail contacts and Google Calendar into CSV (comma-separated value) files. This is very useful for importing or exporting information to other contact book and Calendar software. GMDesk is an application that lets you run Gmail, Google Calendar, Google Docs and Google Maps as a stand-alone application to do all your mail handling, calendar event reading etc with.